Brittany and Cornwall share a Celtic-British history and a similar geography. Each is a westernmost promontory buffeted by Atlantic waves, with rugged capes and cliffs sheltering fishing villages and sandy beaches, while inland lie moors and the neolithic menhir monuments beloved by Asterix. Brittany, though, is almost 10 times the size of Cornwall and retains its own language and distinctive cultural traditions. In a part of northern Brittany blessed with place names like Plouezoc’h,Trudujo, and Beg ar C’hra you’ll find La Ferme de Croas Men nestled in the rolling countryside.The flowery signs by the roadside were painted by Monsieur Cotty, who started the campsite 20 years ago and also created the many objets trouvés sculptures around the site.This is also a working dairy farm shared by four generations of the Cotty family and an ark-ful of animals.They raise and grow food for 45 cows, but there are also donkeys, goats, sheep, ducks, rabbits, chickens, and Max the Pig among the 30 or so breeds. Such a menagerie makes this site a great opportunity to introduce children to all sorts of animals. This is much more than a glorified petting farm, though, for this place demonstrates how farm life has developed over the last century, with a museum of farm machinery next to Ty Coz, the original family cottage, which looks just as it might have in 1900, complete with a beaten- earth floor, massive table and benches, four-poster bed, vintage dresser, and grandfather clock, which stands opposite photos of the great grandparents. Rather than being a dusty, hands-off rural museum, though, this room can be booked for a special breakfast – a stack of pancakes, fresh bread, and home-made jams just waiting to be devoured with tea, coffee, or hot chocolate. The Cottys, among whom Raphael speaks excellent English, allow small visitors to watch the milking, feed the animals, and witness the farm in action throughout the day, asking only that adults are present to ensure safety and that animals are allowed to rest between 11am and 4pm.There are tractor rides and donkey-cart rides around the farm in July and August (keep a look out for over 150 different plants and trees), and plenty to see round about, with beautiful sunken-road walks starting from the farm itself. The historic port of Morlaix is just 10 minutes’ drive away, while the closest beaches and coves on Brittany’s heather-covered northern coast, the wonderfully named Armorican Corniche, are about 15 minutes away by car. Morlaix is famous for its colossal viaduct, the remarkable 16th-century house of Queen Anne of Brittany, and for beating off an attack by an English fleet in 1522.The English sailed up the estuary and found the town undefended and, in true medieval style, proceeded to pillage. But they made the mistake of lingering in the wine cellars until the locals returned to drive the inebriated intruders away, subsequently adding ‘S’ils te mordent, mords-les!’ (‘If they bite you, bite them!’) to the town’s coat of arms. Fortunately, there are no worries about overstaying your welcome any more, with spacious pitches, cabins, or tents waiting for you just 20 miles (32 km) down the coast from the port of Roscoff.They’re used to visitors here year-round as the farm is often visited by school groups, and one of the friendly features is ‘Oscar’, the name given to a building Monsieur Cotty constructed from boulders and stone blocks that Obelix would have been proud to lift. Inside this wonder is an equally massive table for campers and farm visitors to socialise and feast around, whatever the weather. Please visit our website for directions. 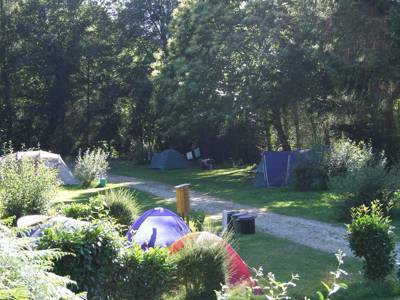 The campsite is very well signposted- just keep an eye out for the pale blue sign posts! Campfires allowed. Fifty large pitches, all with electric hook-ups. There are 2 wash-blocks, but people prefer the newer one in the middle of the site, which is bright and airy with efficient warm showers, laundry sinks, disabled access, a parent-and-baby room, washing machine, and chemical disposal point. Next door is a reception room with walking routes and tourist information, toys, books, and board games for the kids – especially good if it’s a rainy morning. Family fun is right here on the farm, feeding the animals. 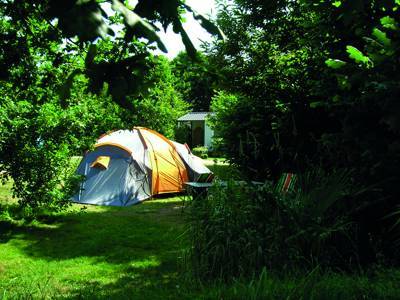 There are 2 wooden roulottes (gypsy caravans), chalets, cabins, and wood-and-canvas tents to hire, too. Morlaix hosts one of the local markets, which take place every day of the week. Only one of them is further than a 15-minute drive from the campsite, so fans of produits régioneux can get a daily fix if they fancy, and discover lovely Breton towns and villages in the process. 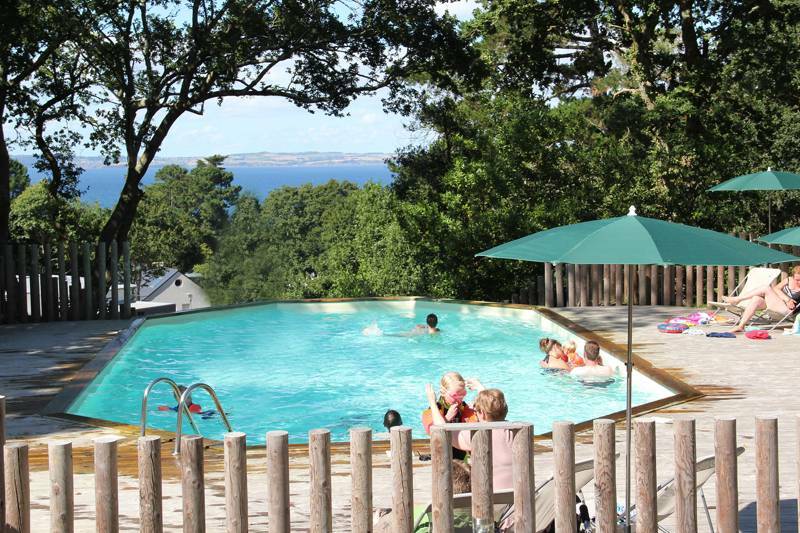 There’s a big indoor pool with slide and jacuzzi at Plouigneau, if the weather’s awful, but otherwise there are so many beaches and coves to explore nearby – the sandy shore, surf, and sailing schools at Locquirec are recommended. Beyond lies the medieval town of Lannion and the pink-and-orange rock formations of the enticingly named Côte de Granit Rose (Pink Granite Coast) are just 25 miles (40 km) away. Whether you choose to breakfast in the atmospheric old farm cottage or chez vous, it’s a meal to savour on a farm where milk, eggs, butter, yogurt, preserves, honey, cider, and apple juice are either made right here or locally produced and can be bought at reception. Factor in local markets and this could be a real foodie treat. The Crêperie L’Hermine (00 33 2 98 88 10 91) on the quiet rue Ange de Guernisac, in the heart of Morlaix, makes a traditional Breton pit-stop after the Saturday morning market. Alternatively, go for a lunchtime treat of fresh seafood or fruits de mer on the terrace of the Brasserie de la Plage (00 33 2 98 79 30 70) overlooking the beach and harbour at Locquirec, or stay for dinner in the swanky restaurant (00 33 2 98 67 41 02). April–October (all the year for renting). 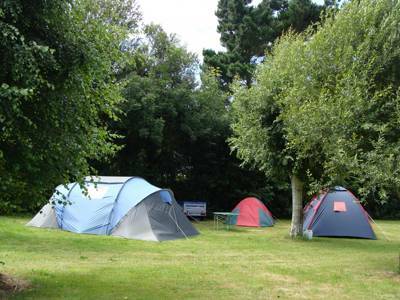 Camping with a vehicle plus tent or caravan and 2 adults €14.44 Extra people over 7 years €3.50, child €2–€2.80. Electricity (6 amp) €3.50. Plouigneau is close to Morlaix, just off N12 between Brest and Rennes. Take the Plouigneau exit off N12, but don’t go into Plouigneau; head for Lanmeur on D64. Drive for 160 yards (150 m) and you should see the first of the pale-blue signs for the farm, 31⁄2 miles (6 km) away. Follow them and you should be fine, but if you do get lost, head for Garlan and ask there.